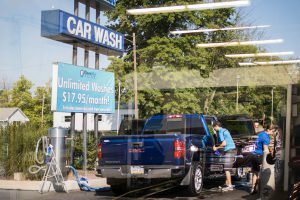 The Kleen Mist Team is responsible for making cars and trucks sparkle inside and out. We take pride in employing hardworking individuals who share our commitment to doing the best job possible. If you enjoy being around vehicles, cleaning, and working outside, this can be a great job for you. We do both routine cleaning and complete detailing and strive to deliver consistently clean cars. Most importantly, you need to have a desire and a willingness to serve customers. Full-time employees typically work between 35 and 40 hours per week. Part-time staff will work as few as 10 or as many as 35 hours depending on your desired schedule. If you provide us with your availability, we can develop a schedule that works for you! Kleen Mist is always looking for individuals who are attentive to detail, motivated to provide quality customer service, and enjoy working with a team. If you think this is a job you would enjoy, please email us at info@kleenmist.com with any questions. Starting rates are typically around $10 per hour. Full-time employees are offered paid vacations and holidays and a retirement plan.